Police say they are targeting young people involved in a new trend of assaults in which they "slap" commuters in the face for no apparent reason. 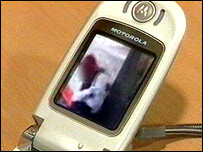 Gangs are said to record pictures of the assaults on their mobile phones and then text them to their friends. Police said the assaults on London's Tube and bus networks were serious incidents and would not be tolerated. Supt Mark Newton, of British Transport Police, said eight people had already been charged over this type of assault. He said: "We treat this very seriously. This is a priority crime for the British Transport Police. "The message I want to get across is that this is not fun. This is an assault." Many schools are also concerned about the phenomenon. One school, St Martin-in-the-Fields, in Lambeth, south London, has banned school children from carrying mobile phones to school entirely. Lesley Morrison, head teacher of St Martin-in-the-Fields High School, said: "If I found pupils were doing this I would take this very seriously and actually treat it as bullying and exclude them for a fixed term from school."